Cycling is for the Dutch a way of life. Everyone learns to cycle in infancy, and for short journeys cycling is the preferred mode of transport. If you go shopping, if you have to go to school, if you have to answer questions in parliament (unless you've got your bike nicked like the minister for the Justice department ;) ) or if you are planning a pub crawl the bicycle can't be beat. Some might even ride a bike for sports or as a way to keep fit, but they are a fringe minority with so many normal bikes on the road. In primary-school we have all done sums involving a cyclist at 18 km/hr, and most Dutchmen will consider this quite fast and long enough. The Dutch ride mainly roadster (sit up and beg) bicycles, and these are supposed to keep working without maintenance. In fact maintenance is a liability, as a new rear tyre increases the risk of theft. Bike theft in Holland is a real problem and the most popular crime, committed either by addicts looking for money, organised gangs from former east bloc countries or by those who have missed the last bus home. In some circles it is even considered normal to steal a similar bike if you find your own bike gone! In 2006 760.000 bikes were reported stolen, which is about 5% of all cycles in the Netherlands! Oh by the way, if you apprehend a thief be nice to him. Only police or criminals are permitted to use force, ordinary persons will be prosecuted. If you arrive by plane, but want to start cycling from Schiphol Airport, there are routes for cyclists leading out. If you want to continue by train there are (yellow) ticket machines situated in the baggage claim area, so you can get a ticket before your bags arrive. If you leave the bike packed you won't need a separate ticket for it. The train station is underneath the departure hall, check the large yellow noticeboards for the right station platform. The airport train to Amsterdam is ideal hunting grounds for pickpockets, so take care. Ferry's from the UK land in Hook of Holland (the station is closed and the bus service doesn't take bicycles), Europoort (nr Rotterdam) or IJmuiden (nr Amsterdam). To get away from the airport or harbour use the Fietsersbond routeplanner to plan your escape. Outside of rush hour (this restriction does not apply in weekends or July and August) it is theoretically possible to take your bike with you on the train. Getting tickets (buy before boarding!) can be quite a challenge though, as more and more humans are being replaced by ticket vendor machines. But shouting at the machine is fine, where humans might feel threatened. These machines probably accept your ATM card with a four digit PIN, but don't let this nice helpful man in line behind you run of with it! Note that having a ticket is not enough, as to make travel as complicated as possible you have to validate your ticket by checking in and out before boarding and when changing to trains run by a different operator (NS<> Veolia <>Syntus<>Arriva). And you'll need a special ticket for the bike (6.90 extra), and be prepared that the designated place for the bicycle is at the other end of the train. If you get there before the train has left this place will either be occupied, or to small to fit your bike. And you are supposed to remove your bags from the bike, but if you are a poor bewildered tourist the conductor might turn a blind eye. Watch out for maintenance work on the lines, which is usually done over the weekend. The busses don't take bicycles (officially). If the trains actually run on time, please don't mention it. Complaining about NS-rail is sociably much more acceptable..
Dutch cyclists grow up around motorcars, and motorists are used to bicycles. It's a jungle out there, and the survivors have figured out a way to stay alive. To a foreign cyclist it will look totally accidental if the observed behaviour coincides with the official rules of the road. You will need some time to acclimatize (For instance Dutch drivers appear always much more in a hurry than laid back Americans), so don't tackle the busiest city first if you can help it. But take it easy the first days and you will be OK because, although it makes a poor epitaph, most drivers now realize that a cyclist can hit a car intentionally head on and it will still be the car-drivers fault by law. You'll know you're accepted into the fold when a passing motorist brushes you with his mirror, instead of giving you a wide berth as if you're an alien! All traffic including bicycles on equal roads from the right has mandatory right of way, but often this is changed with road signs and road markings. Watch out for roundabouts, as the priority rules are varied from region to region to catch out the non-locals. Traffic lights are always situated before the intersection. and we do not have ' right turn on red'. Or if we have it, it is explicit with a sign or with a bypass lane. If you don't obstruct other traffic cyclists can ride two abreast. In some cities cyclists from all directions get green simultaneously. The idea is that cyclist get along fine with a bit of give and take. We have cycle paths which can be ignored by all traffic users.. 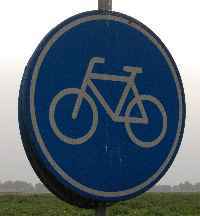 If you encounter a blue round shield with a bicycle depicted this means a mandatory cycle path. 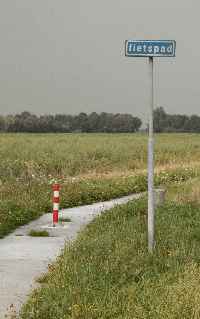 If you encounter the rectangular sign "fietspad" only cyclists are allowed to use the path, but they are welcome to use the track adjacent. If you encounter a red road surface with a bike painted on it, cyclist are suggested to use that bit, but without the round sign mentioned this doesn't mean much. Cycle paths are usually constructed with concrete tiles over tree roots, power lines and mole runs, but red 'double rolling resistance' asphalt is another option. Posts thoughtfully placed in the middle of the path to deter motorists (as if somebody would ride on a cycle path by choice) add excitement at night. Or the path might end suddenly with a 90 degree turn-off shooting you in front of the oncoming traffic which you can't see for the trees lining the road. For cyclist who like cheating there are 'nationale fietsroutes'. These routes for cyclist avoid many of the challenges, involve nice bits of scenery and quiet roads suitable for cycling, and go to places you actually might want to go to. You could try to get a map at the tourist-office or a bookstore, but the routes are signposted. The maps for all routes are available in the guide: 'Basiskaart fietsroutes' @ € 24.95 Get the current one with the maps printed double sided on plastic material, not the old superseded one with the maps printed on water soluble paper! Note that these routes usually include sections through forests etc, where the road surface is not paved. I would suggest a 35mm tyre or wider, especially in the wet season.
' 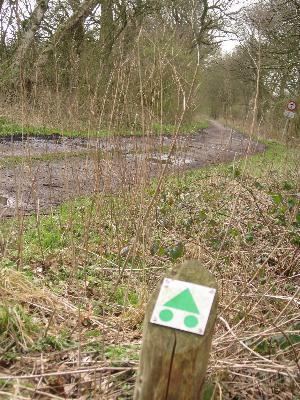 Follow this route' a sign designed to ensure you get lost! The whole country fits on a single road map 1: 250000 (4 mls/") If bought at a red and yellow petrol station, price and quality will be quite reasonable. Smaller scale maps exist, but if you go north-south you'll need quite a few. 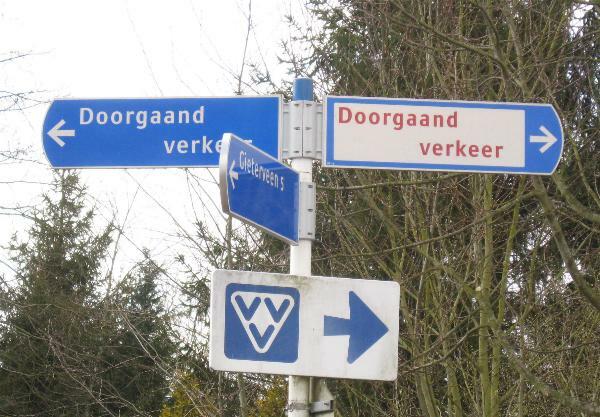 Getting lost in the Netherlands is probably possible, but before long you'll run into one of the 17 million Dutchman who are eager to show off their English. If you prefer a map for your GPS download the free 'Openfietsmap' at http://sites.google.com/site/openfietsmap/ By all reports this one is miles better than anything you can buy! Not surprisingly it is the work of a Cyclist! Most of the country will disappear if we switch off the pumps. So not surprisingly we have very few hills and to confuse matters more the ones we have are often called mountains (= berg)! 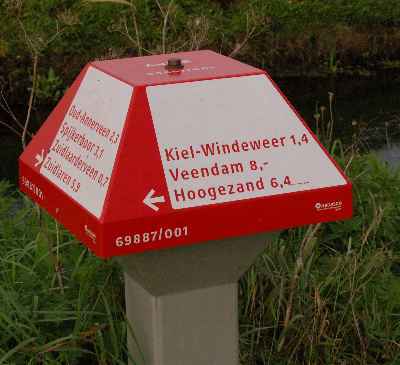 These can be found in the south (The Belgian Ardennes extend into Limburg) or scattered around the National park Hoge Veluwe bang in the middle of the country (Veluwezoom, Sallandse Heuvelrug, Utrechtse Heuvelrug). 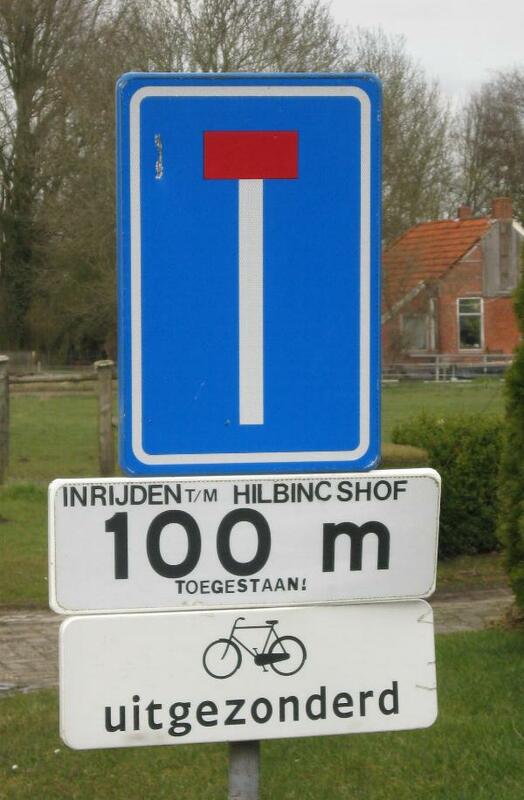 Dutch racing cyclist will know all these hills by heart, foreigners will probably fail to spot them. And I should probably mention the Vamberg, bang in the middle of Drente. It's a 60 m high pile of waste with tracks for road cyclists and MTB's, now open for the public and with a good view from the top over the flat landscape. Don't leave your granny gear at home though, because what we have everwhere is Wind! The country is very open in places and you could face a tough headwind all day long. If you're lucky the headwind will be dry ;). The Netherlands have a sea climate, heavily influenced by the North sea and the gulf stream. Winters will be mainly wet, cold & windy (barren fields don't provide shelter) . and it will take some time for things to warm up in spring, with that mass of cold water about. Campsites will probably be closed November-March, if only to prevent the taps from freezing up at night. Most will open up around Easter. April-October the weather will be variable. You could have a week of showers, but a month of no rain whatsoever and splendid sunshine is possible too. A rainy day could be anything: single shower in the morning and fine for the rest, continuous drizzle or a fresh shower the moment you've dried up. Outside summer expect the mornings to start cold with lots of condensation in lower areas. Watch the long range weather forecast and bring a rain jacket or more, and some dry socks. Main language is Dutch, which is spoken in a great many dialects and regional accents. No need to take a language course yourself, it's pretty hard to leave secondary school here without some understanding of English and the TV always had subtitles. 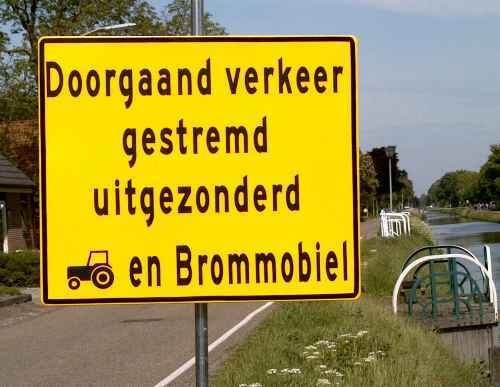 Just be prepared for a fair bit of accent, the full use of Dutch grammar and a total lack of please and thank you as that is far less common in Dutch than in English language societies..
As with almost any country, if you ride up and down the country there is quite a bit of variety to be found. Variety as in landscape, architecture, culture and even climate. As a rough guide, the south is Catholic, and the dour Calvinists are up north;). The most densely populated bit is the 'Randstad' (the mid west bit comprising Amsterdam, Rotterdam, The Hague, Utrecht) which is also where you find the most international known tourist attractions, No problem riding your bike there as there are plenty of cycle paths and amenities, but it won't be quiet as there is just too much going on. Coastal area's are mainly flat, with dunes & beaches along the north sea coast from the Hague to the isle of Texel. Pop over along the Afsluitdijk (easier said than done, see the noteon the closure below) , and along the northern coast (Waddenzee) there are no beaches, unless you hop over to one of the many islands. The islands are not very big, but some on the left are interconnected by tiny ferries which take bicycles. The province of Friesland is pretty wet, so loaded with ditches. canals, -open- bridges, lakes and boats. Frisians have their own language, but they are pretty relaxed about it, and there are lots of historical little towns to visit. Groningen is mainly farming country, and wide open. So open in fact that on fridays you can see Sundays visit coming ;). But plenty of small roads with little traffic. 100-150 years ago there was a lot of wealth going round, so there is some impressive architecture (Try Usquert for 'Amsterdamse school') and some fine church organs. But you'd better hurry, because earthquakes caused by the winning of natural gas take their toll, with no chance of fair compensation for repairs. Going south along the German border, the landscape will offer more protection with hedgerows and maybe even small woods or gentle hills. For cycling Twente & de Achterhoek ( the eastern parts of Overijssel & Gelderland) are pretty nice. All the way down south in the province of Limburg the hills will be tougher, as you then run into the Ardennes and too many cafe's with 'vlaai' and excellent brews! Continuing the circular tour Brabant isn't too bad but spoiled by too many pig farms and maize fields. Zeeland has plenty of coastline and is geared to German tourists, but you might find the infrastructure (put up after the floods of '53) to keep the sea out interesting. The old provinces in the middle (Utrecht, Gelderland, Overijssel) are fine for cycling, but the reclaimed land along the IJsselmeer (Flevoland, Noordoostpolder) is pretty flat and monotonous. And nothing is older than 50 odd years there except for the incorporated islands. 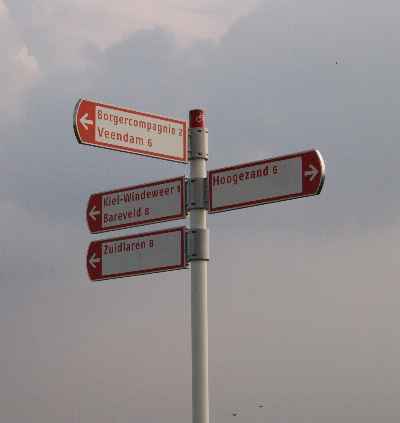 We have lots of signposts in the Netherlands. Red letters on white are signposts for cyclist (these usually point to one out of a series of 10 different hamlets in about the same direction), blue/white signs for motorcars actually mention the place you want to go. Too bad you don't know about that bit of motorway in between. Green on white signs are also used for extra long (?) and scenic cycle routes. Black lettering on yellow are temporary signs used for detours, as it is common with road reconstruction to block the whole road instead of mucking about with temporary traffic-lights and single file. On a bike the best approach is to ignore these signs and press on. Occasionally this won't work as you'll find a bridge completely gone, but more often you' ll avoid a lot of -illegal for cyclists- motorways and silly detours by just walking a short stretch and asking nicely! You know it must be weekend with a good forecast when the E-bikes come out in force. The typical E-bike is bought in pairs by couples who can't ride a bike worth a damn to enable them to terrorize a larger part of the country. They will pull left without looking over their shoulder, come round blind bends on narrow tracks through the forest with the power setting on 11 and ride two abreast oblivious to other road users. 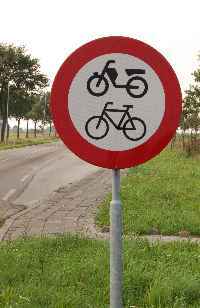 Signs to look out for are bikes with fat hubs, erratic pedaling (pedal only half a turn to prevent the electronics from cutting out, saddles too low, matching outfits warmer than a cyclist could stand and blue rinse. They are all deaf as a post and will complain loudly that you should have used your bell. You have been warned! In the Netherlands supermarkets are located in easy reach for cyclists, so you'll find them in small shopping centers in the suburbs or in the center of the town, and not outside the city limits on the main road. Next to one or two supermarkets you can also expect local merchants like a bakers shop, or a greengrocer with perhaps a greater choice in products. There are plenty of supermarket chains to choose from, Lidl & Aldi are cheap but limited, Albert Heijn (ignore the special offers, they are loyalty card only) & Jumbo are more varied and upmarket, and Coop is a formula to take advantage of rural areas with little competition. There are also local chains. You might also want to keep an eye open for local markets, which can be a good source for cheese, fresh fish or vegetables. Note that 24 hour economy in the Netherlands refers to the working week, so if you want to buy food you'll find most supermarkets close at 20:00, and they won't be open on Sundays unless the management is really clever and you're well clear of the bible belt! (=Veluwe) In rural area's they might close even earlier. Unlike Germany, bakers are shut on Sunday. Smaller shops like bikeshops are often closed on Monday, they will be open on Saturday, but maybe without a mechanic present. Typical opening hours are 9:00-18:00. Cafe's and bars won't close that early, and in some cities it is possible to keep drinking around the clock. If you're over 18 and manage to stagger to the next place that is. Tee-totalers might not appreciate the Dutch Coffeeshop thoughtfully situated near airport or border, although no alcohol is served in those places. On the subject of coffee, many supermarkets have a free courtesy coffee machine in the back of the store. Buy a bag of Krentebollen (currant bread rolls) and a few bananas, and you're good for the day. If you want fast-food drive past the McDonalds and go to an authentic cafetaria. 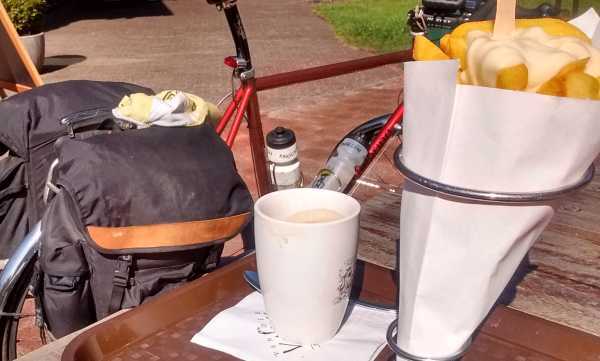 Get yourself a ' grote patat met" (large french fries with mayonaise) or something similar unhealthy (who cares, if you're cycling you need all the calories you can get;) ) and save some money. Top of the bill is a 'Kapsalon' where you can actually feel your arteries clogging up ;) If you survive you can go for jellied eels or fresh herrings from a street stall next! Another thing to keep an eye out for are restaurants serving 'Pannekoeken' ie pancakes. Great cycling food (lots of filling options) and the family style restaurants won't mind kids, dogs or dripping wet cyclists. Chinese restaurants are also an option (they are pretty big on take-away too) but be prepared for many Indonesian dishes, as they are heavily influenced by the kitchen of our former colony. Tapwater will be high quality everywhere and safe to drink. You're not supposed to camp in the wilds or in what we consider wilderness. You'll probably fail to spot our nature reserves because we have nature organized. This is big business involving committees, planning permission, designers and heavy earthmoving equipment. Certainly not something to be left to nature, which is why it looks different. But if you pick your stealth camping-spot with care you could be ok, just don't try this in the height of the tourist season in coastal resorts as evasion of the tourist tax is frowned upon! Campings are probably closed October-April. If you decide to tour in the off-season, you'd better bring decent rain gear. With a sea-climate being out all day on a bike on a rainy day would not be my idea of fun. The latest thing is that wild camping in our organized wilderness is now organized and regulated too! In some forests, spots are marked where you can pitch your tent for the night. Don't look for it on the site of our forestry commision: staatbosbeheer. it is unintelligible, and knowing Dutch doesn't make it any better.The Hiking site has a list with place names and GPS coordinates of the sites (click on the map (the red spots don't mean a thing) and you get a list of the closest spots. Pitch your tent within sight of the pole and boil the water (there should be a well) before consumption. Take your trash, don't build a fire and leave within three days. 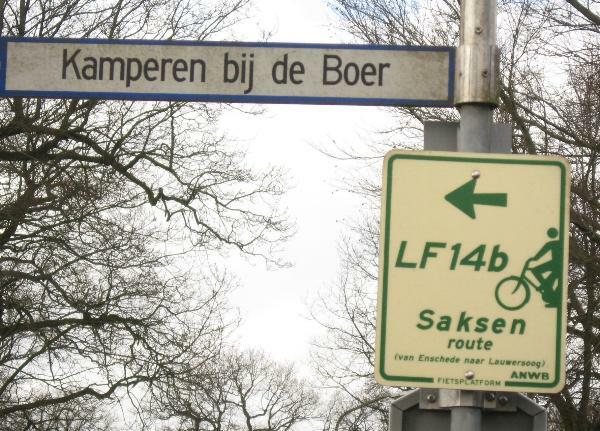 If you're not the camping type you will appreciate the foundation Vrienden op de Fiets. This is a widespread network of people offering a room and a breakfast for fellow cyclist for 19.00€ or less.You'll have to join the foundation for the adresses, but it 's only a nominal fee. They have a website and there is even an English language option, see the bar at the top! Usual procedure is that you don't reserve your lodging much in advance, but figure out where you will end up during the day and phone round to see if somebody in that area can put you up that night. Ride the Afsluitdijk, the dike which turned the Zuyderzee into the fresh water lake IJsselmeer Depending on the wind, this could take you all day as it's 25 km long. Sorry, the Afsluitdijk wil be closed to cyclist for repairs as of 1/4/2019 , maybe there will be a shuttle service. Ask the miller if you can take a look inside if you spot a working windmill, we have lots! Visit Groningen, which was once voted Fietsstad (cycling town) of the year. The cycle paths fitted with sleeping policemen probably clinched it! Take a girl friend home on the luggage carrier after a night out. Many cycle paths through the Dunes are fitted with barriers, speed bumps and other attractions to turn away cyclists. You might have to unload to get your bike through the narrow barriers! We have more holidays than we know what to do with, and they are all thoughtfully positioned late spring/early summer. The anniversary of our Queen (30-4) is a nice example as the real anniversary of our current Queen Beatrix is ignored because of the possibilty of inclement weather. We've stuck to her late mothers birthday as it makes so much more sense! Update , we have a king now, and our Kingsday is now on 27/4, the actual birthday of his Royal King Willem Alexander. The usual way to pay for your shopping is either with cash (euro's) or by debit card (Maestro) with a 4 digit PIN. Most shops will round off the due amount to the nearest 5 cents as the 1 and 2 cent pieces are a pain. Credit cards (which are expensive to process) are not as widespread as debit cards. Restaurants and shops aimed at tourists will probably accept them, but check (decal on the door?) if they are acceptable. Due to the widespread use of cellphones, public phones are disappearing fast . There were 440 left at the last count in the whole country, mainly at airports or city-centres. For Non -EEC residents, if you bring a cellphone make sure it takes a sim card and doesn't have a sim lock so you can use a locally obtained prepay card. Even then phoning home might cost a fortune, but receiving one won't be so bad. Texting will be cheaper than voice. I'd try a public library or asking your host. And many people have wireless, so you could stumble on an open connection by accident;) Many cafe's etc will also offer free wifi. Dial freephone 112 for police, ambulance or fire services. If dialed from a portable phone you are routed to a national switchboard, and they can now locate an Android phone pretty accurately. I-phones are coming next. Expect the operator to be able to speak -basic-English. Doctors are well hidden behind answering machines and are often organized in collectives to ensure they have enough days off. Don't waste too much time trying to find one and head for the emergency department of any hospital. Once you've found one, unlike US doctors a Dutch physician will not try to prescribe the entire contents of the pharmacy to cover every unlikely eventuality, even though the same medication will cost a lot less here ;). If you want to bring electric chargers or whatnot, mains is 220-240V AC. You'll need an Euro style plug, the kind with two round prongs 3/4" apart. Biggest natural danger is probably drowning if you haven't learned how to swim. If you accidentally fall in (too many beers & canals don't mix! ), first try if you can stand. Many canals aren't very deep. 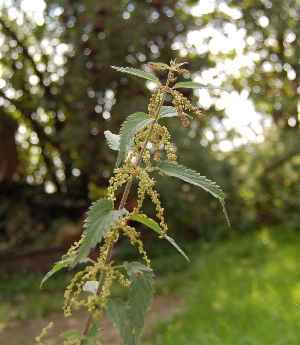 There aren't many dangerous plants but touching stinging nettles will be very unpleasant. Especially after some rain you will spot them hanging out over the cycle path, looking for a bit of leg. Rub the offending spots with the crushed leaves of ground ivy or plantain. Avoid Bereklauw (Hogweed) too. Animals: Dutch wild animals are pretty well behaved. In theory you could get run over by deer, catch rabies near the German border, get savaged by a wild boar (lots of them in the national park Hoge Veluwe), get bitten by an adder (poisonous snake) or get stung by bees but you would have to work at it. The exception are ticks, many of which are infected with Lyme's disease. If you are bitten by one remove it as soon as possible, within 24 hrs. If you subsequently notice any red discoloration spreading around the bite or get flu-like symptoms consult a doctor straight away. Another pest in the south of the country but spreading north, and active from the middle of May till July can be the Oak processionary, whose poisonous hairs can cause asthma and skin irritation. You might encounter warning signs "Processierups" taped around the trunk of infected trees. Another danger of late coming from the trees could be an airstrike by a buzzard protecting its nest. If they are really aggressive the council will put up signs. About 200 people were murdered in the Netherlands in 2005, and about the same number of cyclists died in a traffic incident. In other words, if personal safety is a concern don't go home. Some neighborhoods will not be as nice as others, but we don't have no-go zones as in the USA or France.